The Office of Diversity and Inclusion partnered with Academic Affairs Jan. 25 to host the second annual “Inclusion Starts With Me” Teach-In. With an array of topics ranging from “The Day Rihanna Turned Black: Race, Creolity, and Contemporary Popular Culture” to “Building a Community of Active Bystanders to Prevent Sexual Violence,” students had the opportunity to attend more than 25 workshops. One of the interactive workshops was “Art as Activism: ARTIVISM” and featured Papel Picado with the Chicanx/Latinx Faculty & Staff Association, Watercolor with Kennedy Library, Zine Making with the Cross Cultural Centers, Guerrilla Screen-Printing with Elizabeth Folk and the Art Department, Button Making with the Office of University Diversity & Inclusion and Aerosol and Screen-Printing with Self Help Graphics and Arts. Self Help Graphics and Arts is an East Los Angeles organization that aims to empower Latinx and Chicanx students by providing a space to create art. Founded in 1970, Self Help Graphics and Arts has created a long-standing community of more than 50 artists invested in this mission and its name has been recognized nationally and internationally. The organization hosts workshops on DIY screen printing, photography and printmaking, natural dye making and aerosol art. They also facilitate art exhibitions, craft and art fairs that feature local art multiple times a year. 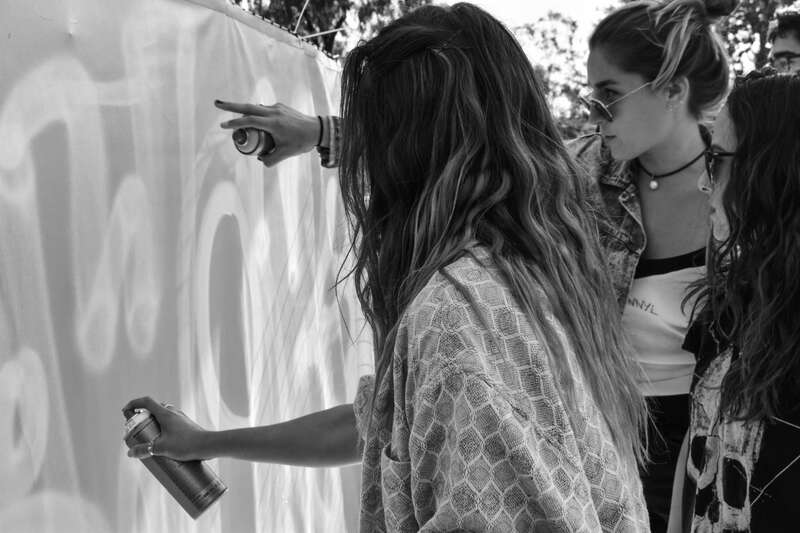 Bringing aerosol spray paint and compassion together, Self Help Graphics’ Melissa Govea, Dewey Tafoya and Joel Garcia took over the University Union Plaza (UU) stage to create a “B-Woke” graffiti art piece. With the help of students, they created a sign, meant to encourage students to be socially and politically conscious of current affairs. Among the students at the workshop was sociology and ethnic studies junior Francisco Gaspar. Gaspar explained that achieving an endpoint in how socially conscious you are is not a goal. “It’s more of something that you’re constantly engaged in if you’re trying to better yourself and those around you because there will always be opportunities to learn more, opportunities for growth, opportunities to build and expand your knowledge on communities that you don’t identify with or aren’t necessarily exposed to on a regular basis,” Gaspar said. Surrounding the main message “B-Woke” on the graffiti art piece, there were additional sayings such as “decolonize” and “resist” to emphasize art as a means of activism and empowerment. Students were also supplied with appropriate tools to create vibrant pink and blue stencils that featured unique designs, logos, their names and other mantras. Self Help graphic artist Dewey Tafoya was encouraging throughout the creative process. “I’m hoping that they can create something and empower themselves with whatever voice they have by making a protest poster or a sign that says something that’s important to them really, and just kind of leaving here with something that says something about themselves,” Tafoya said. Events like the graffiti workshop with Self Help Graphics are intended to foster an environment that embraces and promotes diversity by bringing experienced innovators and artists of color to campus. Ethnic studies senior Jeremiah Hernandez explained why these events are important especially considering Cal Poly’s lack of diversity. Cal Poly has one of the least diverse student populations in terms of income diversity in California and was ranked last in low income access when compared to other public universities in California. “You have a lot of people that come over here for a lot of different reasons, but I feel that— and this is fact— that a majority of the student population is affluent. You know, this is a fact. We know this, it’s been like this for years. So when you get something like a majority of the student population being affluent, it’s not diverse … We need to bring that diversity,” Hernandez said. Cal Poly’s student population is 56.4 percent white, 16 percent Latino, 0.7 percent African American, 0.1 percent Pacific Islander, 0.1 percent Native American, 12.6 percent Asian American and 7.1 percent multiracial, making it the least diverse California State University. Given these statistics, Gaspar noted that diversity and inclusivity events are not the sole solution to improving the lack of diversity at Cal Poly, but are a step in the right direction. “I think it is also important to recognize that there is more that’s needed than an event like ‘Inclusion Starts With Me,’ and it’s a good conversation starter, but we need to progress further in creating better institutional circumstances for the people that currently attend the institution of Cal Poly and feel marginalized,” Gaspar said. Correction: A previous version of this article misspelled Francisco Gaspar.